Thank you! 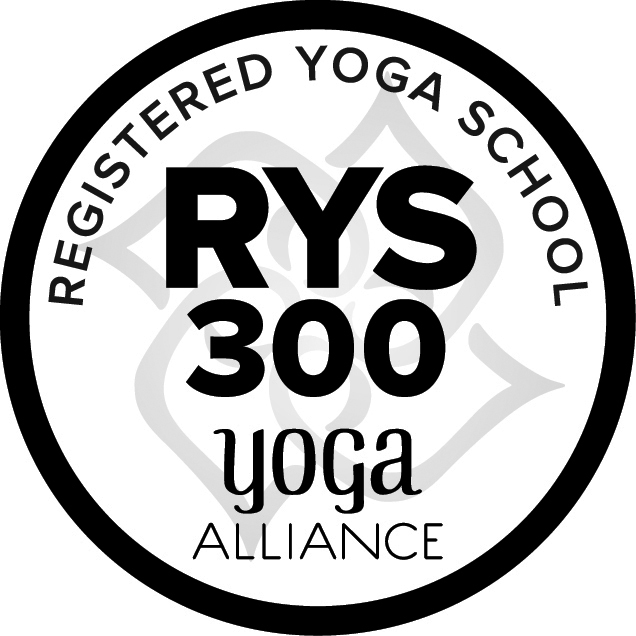 Click here to download your 300-hour Holistic Yoga Flow Advanced Teacher Training application. An application will also be sent to your email within the next 24 hours. 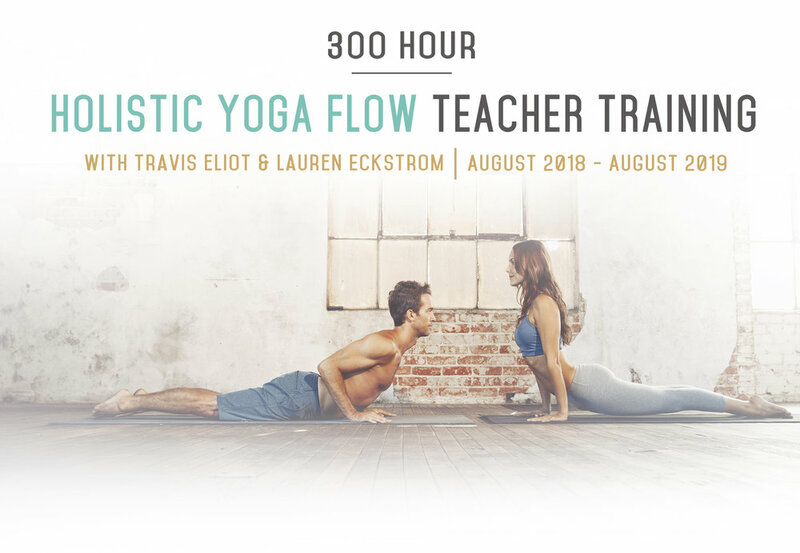 The 300-hour Holistic Yoga Flow Advanced Teacher Training is for yoga teachers who are interested in deepening their practice and expanding their knowledge of the principles and philosophy of yoga. We believe in supporting teachers on the road to deepening their personal practice while providing support, knowledge and training so that you are empowered to create classes which provide students with an experience that transcends the mat and uplifts their life and our global community. The advanced training is broken down into modules that focus on the fundamentals of teaching a safe, sound class: yoga specific anatomy, Holistic Yoga Flow sequencing, and Yin & Restorative Yoga. But most importantly our advanced teacher training guides you toward a deeper understanding of meditation, pranayama, and the philosophy of yoga to craft not only inspiring classes but a life of purpose and clarity. Join Travis Eliot & Lauren Eckstrom to expand your class sequencing skills. This immersion will focus on the fundamentals of creating a Holistic Yoga Flow class in which you learn how to craft dynamic classes that build toward a peak pose, revolve around specific movement principles, and expand upon yoga philosophy and subtle anatomy themes. Learn to teach with the clarity and inspiration that makes Holistic Yoga Flow a beloved practice of students around the world. Join Travis Eliot & Lauren Eckstrom for a foundational training in the basics of Mindfulness Meditation and Pranayama. In this module you will learn the science and benefits of both meditation and pranayama as well as the techniques necessary to guide students safely and effectively through these practices. With the proliferation of meditation and breath work, mindfulness and pranayama education are a must for every teacher. In this training you will explore deeper into the practice of Mindfulness Meditation and Pranayama. Travis and Lauren will share special dharma talks along with deeper practices in breath work and meditation. This module will also include some gentle yoga practices, the latest science research, basic neuroscience, journaling, group learning and practice teaching. Join Travis Eliot & Lauren Eckstrom and Get Clear! This module is our personal version of holistic health coaching in which you will learn to apply Yoga Philosophy to discovering your passion and purpose while getting clear with your dharmic path. Get Clear goes far beyond the Yoga Sutras to help give you applicable ways to implement yoga philosophy to create a life and path you love for yourself and your students. Ayurveda is “the science of life” dating back over 5,000 years. This powerful modality views the human being as an interplay of mind, body and spirit. Its purpose is to heal and maintain quality and longevity of life. Join Travis Eliot for an in depth immersion into ayurveda. This immersion will be a mixture of ayurvedic themed yoga practices, lecture/presentation, discussion and workshopping covering the History of Ayurveda, Fundamentals, Nutrition Herbs, Diagnosis, Treaments, Marmas/Essentail Oils, Yoga Poses and their Doshic effects, Ayurveda Psychology and Vastu. Join Travis Eliot for a magical exploration into mantra, yantra, and mudra. Come prepared to chant and learn about these mystical aspects of yoga then leave empowered to add these themes into your personal practice or public classes. Yin yoga is the holding of floor poses as a way to improve flexibility, activate healthy connective tissues, and to balance the nervous system. Restorative Yoga is a passive practice meant to activate the body’s relaxation response and healing abilities by offering an environment of ease and effortlessness. In this training you'll learn the history of yin and restorative yoga, the science of yin and restorative yoga, the energetic benefits of yin and restorative yoga, and an exploration of the most common yin and restorative poses along with their cues and applications. Once you’ve completed all of the modules, you will enter into the Mentorship phase of your Advanced Teacher Training. During this module you’ll work with Travis and Lauren to help create class sequences, flush out your business plan, write inspiring content, design and execute a service project and further deepen your teaching path. This module will be completed online. Travis Eliot is a world-renowned yoga and meditation teacher. He teaches his signature Holistic Yoga Flow classes in Los Angeles and in workshops and retreats around the world. His style is intensely dynamic and has inspired many of today's top athletes, celebrities, and entertainers. He is the creator of the groundbreaking programs The Ultimate Yogi, Yoga 30 for 30, along with many other best-selling yoga DVDs. He is the co-author of the modern day yoga bible, Holistic Yoga Flow: The Path of Practice. His highly acclaimed chant album, The Meaning of Soul, debuted at No. 3 on the iTunes world music chart. He is the CEO of Inner Domain Media, director of Holistic Yoga Flow teacher trainings and a member of the faculty of the prestigious Kripalu Institute and 1440 Multiversity. A Yoga Alliance-certified E-RYT 500 instructor, Travis has been featured in Yoga Journal, LA YOGA Ayurveda and Health, Mantra magazine, Conscious Lifestyle, Asana Journal, Self, Fitness Trainer, Access Hollywood, and The Huffington Post. Lauren Eckstrom is a Holistic Yoga Flow E-RYT 500 Yoga Alliance-certified yoga teacher and certified mindfulness meditation instructor. She guides some of the world’s most well- known musicians, filmmakers, executives and Fortune 500 companies in both yoga and meditation. Lauren leads Holistic Yoga Flow workshops, retreats and teacher trainings in the Los Angeles area and internationally. She co-created the 30 minute, 30 day online yoga program Yoga 30 for 30 which has been downloaded in all 50 US states and over 44 countries across the world. Lauren co-authored Holistic Yoga Flow: The Path of Practice and was the associate producer of the award-winning DVD series The Ultimate Yogi. She has written about yoga and mindfulness for Yoga Journal, MindBodyGreen.com, The Huffington Post, LA YOGA Ayurveda and Health, and Mantra Magazine. She is on the faculty at 1440 Multiversity and was recently featured on the cover of Yoga Journal. She was also named a Yoga Journal Influencer, as one of the top 15 teachers to study with. What are the requirements to enroll in the 300-hour Holistic Yoga Flow Advanced Teacher Training? Some modules can be taken without having a 200-hour certification. 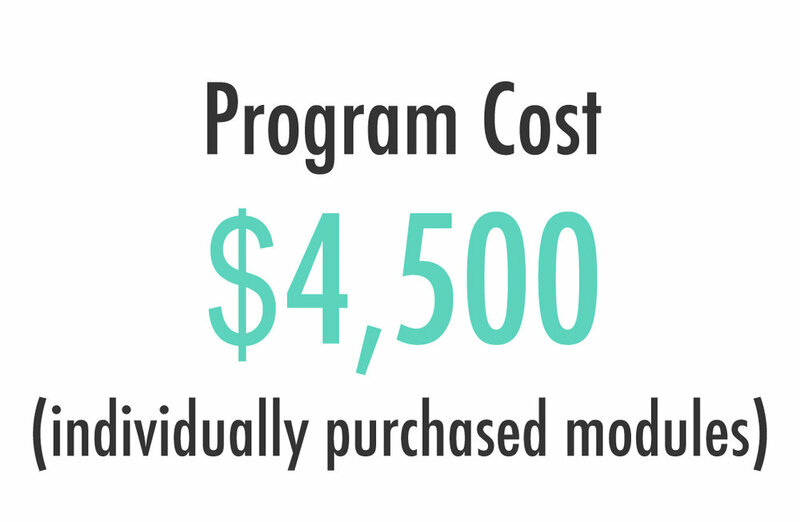 Other modules, such as Advanced Sequencing and the Mentorship, require that you already have a 200-hour certification. If you are interested in applying to any of the modules, please email info@oldtownyogastudio.com to learn more. What is length of the 300-hour Holistic Yoga Flow Advanced Teacher Training? The 300-hour Advanced Teacher Training certification is broken down into 2-4 day modules so that you can personalize your continuing education. Sometimes the modules will be taught back-to-back for an immersive experience. In other instances, the modules will be spread out over several months, occurring primarily over the weekends, to help accommodate your schedule. Where will the 300-hour Holistic Yoga Flow Advanced Teacher Training take place? Old Town Yoga Studio in Clovis, Ca. Can the modules be taken in any order? Yes, the modules can be taken in any order except for the Mentorship which is the final module in your training if you choose to complete the entire 300-hour Holistic Yoga Flow Advanced Teacher Training. Do I have to take all of the modules? If you want to complete your 300-hour training with Holistic Yoga Flow, yes, you need to complete all of the modules. If you are simply interested in continuing your education and focusing on specific areas and are not looking to complete your full advanced teacher training, you can take the modules that fit your specific interests for continuing education. Thank you! We will get back to you as soon as possible!.